Future Rock will play the 12th annual Starscape Festival at Fort Armistead Park in Baltimore, MD. 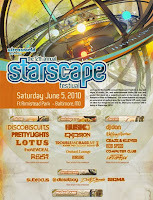 Starscape Festival takes place June 5, 2010 from 2pm-6am. This year's event will include 6 areas of music including The Main Stage, The Beach Stage, The Dance Tent, The Drum & Bass Arena, The Nudashank Art Gallery & Performance area, and the Lost World VIP stage. Future Rock will perform on The Main Stage. Get tickets now!